Mansfield's District Council has relaxed its 24-hour ban on cycling in the town centre, which it said was introduced ‘to tackle anti-social cycling at busy times’. Cllr Bill Drewett, portfolio holder for safer communities, took a delegated decision to amend the town’s Public Spaces Protection Order (PSPO), which will mean cyclists will be able to use their bikes in the pedestrianised areas of the town centre between 6pm and 10am, seven days a week. He said: ‘I carefully considered if the cycling ban in the town centre continued to be justified and proportionate and decided that it does need to apply seven days a week but could be relaxed in the evenings, at night and in the early morning. Cllr Drewett took the decision following an eight-week public consultation at the end of last year. He also considered the effectiveness of the PSPO wording, information and road signs. A council spokesperson said the decision to keep the partial prohibition in place was in response to an effort to tackle anti-social cycling at busy times. 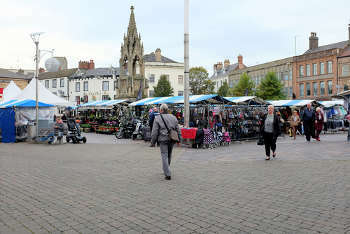 She told Transport Network that the council receives regular complaints from market traders and members of the public about cyclists speeding through the market place and nearly knocking people over, or pedestrians ‘having to dive out of the way’. While road signs will be adapted to reflect the amended rules, the terms of the ban remain otherwise unchanged, so anyone who fails to dismount when asked to do so by an authorised officer in the specified area commits an offence and could be liable for a £75 Fixed Penalty Notice.